Have a great idea for an event in Jim Deva Plaza? Does your organization need financial assistance? Apply for event sponsorship and make your idea happen! Deadline is March 20, 2019. Jim Deva Plaza encourages events and initiatives that bring residents, families and visitors together and enhance both the livability of the West End and the vitality of Davie Street. 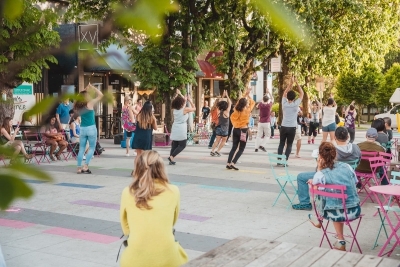 Activations in the plaza, whether they include celebrations, one-off or ongoing events, or community programming, help enliven the space and contribute to its success. This year, Jim Deva Plaza will be supporting a limited number of events with sponsorship, including up to $500 for one-time events and up to $1,000 for recurring events. Shoulder season (March to May and September to November) events as well as ‘traditional holiday’ themed events such as St Patrick’s Day, Halloween, and Christmas are encouraged. Sponsorship from the plaza aims to showcase Jim Deva Plaza as a vibrant gathering space. The plaza supports non-profit organizations, charities or individuals that organize events through financial and/or in-kind contributions. Applications for sponsorship will be evaluated against the plaza’s sponsorship criteria. Please see the attached guidelines for a full review of what is required. To apply, click here. Deadline is March 20, 2019.